Hate targeted ads popping up on every page you surf after you Googled for a particular thing about 7 days back. Do you want to keep the website you visited private and not appear when you have a sibling browsing the Internet? There are plenty of reasons to keep your Internet browsing private and anonymous. 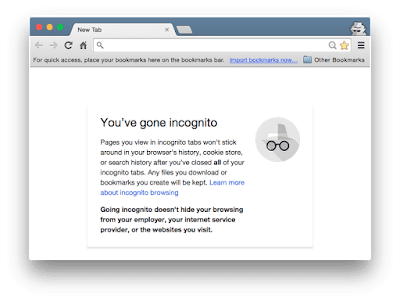 If you too wish to stay anonymous avoid website trackers to pick up every move on the Internet, then you can try the following tips. These tips will help keep your Internet browsing private from everyone. If you wish to stay anonymous from everyone online, then The Onion Router (Tor) is the answer. It is a specially designed Internet routing system. It helps route traffic by encrypting the IP address of their origin. You can use the Tor browser that can be easily downloaded as a plug-in for an open-source browser such as Firefox. The most common way for advertisers to sneak up during your browsing sessions is by tracking your browsing habits. You can prevent this by turning off their ability to track cookies. This may not be the ultimate solution to remain private, but it makes it difficult for advertisers to build a profile around you. Many websites have started to gather location data of the users to help identify who they are. It is better to turn off the location data on your browser completely. This will prevent broadcasting your IP address to every server you reach. Using the Do Not Track flag you can get some protection from trackers. This is not much of a tool to remain anonymous, but it helps keep some information related to your browsing habit private. Keep in mind, there is no rule for web servers to follow this flag. So do not expect much help from it. HTTPS is the best way to keep away nosy sniffers away from your private business. However, not all websites use HTTPS. Thus, you can try the HTTPS Everywhere browser extension that forces SSL connections on most websites. This extension can be installed on Firefox, Chrome, as well as Opera and keep your web traffic safe and secure. The browser you use can leak your network information to a web browser. This can happen when the WebRTC is enabled on your browser. It will allow any website to get access to your real IP address when using a VPN. So, make sure WebRTC is disabled on your browser. Firefox users can do it by about:config, and select media.peerconnection.enabled to “false”. You can even try uBlock Origin to turn this off in Chrome and Firefox. Do you think your browser is secretly sharing information related to you? Then it is time to check out BrowserLeaks.com. It will help you know about all the information your browser gave away to trackers. There are many other ways to keep your Internet browsing private and anonymous. You could try using Proxy servers and VPN addresses to browse online. You could even opt out of “shared endorsement” in Google ads and turn off the ad personalization in your Google account settings. This will prevent Google from creating a profile related to you for targeted mails. You can even download Google Analytics Browser Add-on to disable Google Analytics from tracking your movements. Keeping your privacy safe online may be difficult; however, you can take a few steps to maintain it as much as possible.